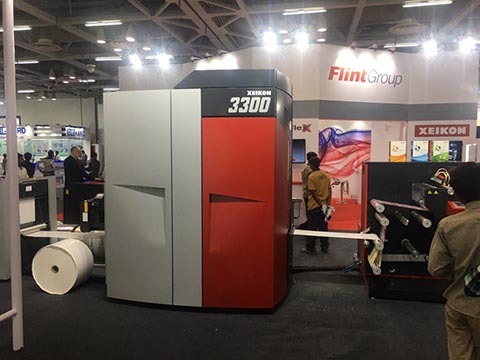 Eede, the Netherlands – The digital front end capabilities of the highly responsive Xeikon 3300 proved to be a real crowd pleaser at Labelexpo India. Stealing the limelight was a roll-2-roll configuration which was sold at the show. Visitors were interested in its digital front-end capabilities and how the responsive and flexible system can cost effectively expand their business production capabilities and door opening opportunities. The entry level narrow web label press excels in productivity and prints at true 1200 dpi. Supporting high quality production for self-adhesive labels and the heat-transfer sector, it is the only digital press with a real prepress workflow and strong color management functionality to ensure maximum performance with CMYK + White. The Xeikon Color Control is an industry unique application to enhance make ready features, optimization of the CMYK color gamut and providing easy to managed introduction of special color to further enhance the press capabilities. It was shown along with print samples from the recently launched PX3000. The UV inkjet press was developed in response to the growing need for digital label printing technologies that drive new applications and produces them in the most efficient way. Bent Serritslev, Xeikon’s Managing Director APAC, says, “We are committed to delivering leading edge solutions and our significant presence at Labelexpo India underpins that. We were delighted to see so much interest in digital development during the show and that was reflected by the number of strong leads we received”.